Can you imagine? You’re conducting an interview, and you’re actually showing the person what the job involves (it was an active role, so demonstration was required). Things are going along okay, and then, while you’re in the middle of demonstrating something, the candidate just walks away. No explanation, no words, they just walk away. When you go find them, you find out they’ve wet their pants. I remember that interview well. The interview had gone on for a bit longer than planned, and they weren’t able to tell me that nature was calling. When it happened, they just walked away. No, I’m not exaggerating. I had no idea what to do. I had no clue how to handle it. I’m not into belittling a person. Imagine how that person felt in order for that to happen! Never mind how they felt about it actually happening! That threw me off my game for the rest of the day. I had eight more interviews lined up that day, and I flopped them all. I didn’t have the experience, training nor awareness back then that I have today. It was a shipwreck. The reality is that an interview is a pretty emotionally charged experience. And not just for the person being interviewed. 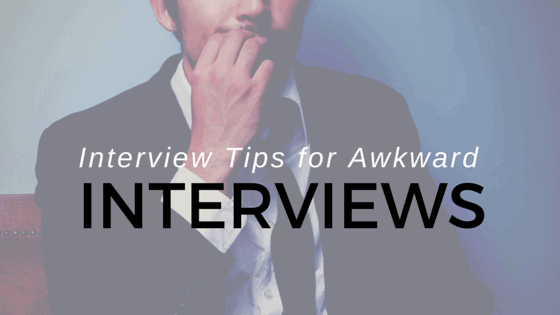 You may not have had an experience like that one – and I’m sure if you have interviewed people before you’ve felt uncomfortable sometimes. As a different example, you are aiming to find a person to fill your role (which you wanted filled last week), and you get an application that couldn’t look any better if you had written it yourself. You meet the person and they look the part – you really want to hire them. This is where you can get uncomfortable, because you’re bordering on desperate and this person looks perfect! You’re thrown off your game. You can see from the example above not every feeling of discomfort is going to be because of something awkward they do or because of the requirement to ask a tough and personal question. Discomfort can be the result of a negative or a positive. Either one can throw you off your game. Make sure you’re centred– When he wet himself, I was not centred at all. When I’ve been desperate to fill a role, I easily overlook negative indicators because I’m not centred. The easiest way to get centred is to focus on breathing to your belly. It immediately brings you into your body and into the now. Maintain an observational approach – In both the situations above (and many, many others) I didn’t use my ability to observe. I mean, its pretty tough to hide when you have to pee – I missed that! It’s also pretty tough to observe when you are desperate. Ask any sailor who arrives at port for the first time in 6 months. Slow Down – We can easily get so busy that we rush. I don’t know about you – when I rush, I’m not centred, I’m not being observational, and I’m going to make a mistake. Slow down. Breathe. Rome wasn’t built in a day. Be Willing to Experience – I was totally unwilling to experience in both of the examples above. I was unwilling to experience that someone had wet their pants, and I was unwilling to experience this great person not taking the job. One I was aware of, the other I was not. In both cases, I received what I was unwilling to experience. That’s how it works. Ask if they’d like to use the bathroom – This just makes life easy.